5-HTP (5-hydroxytryptofan) är en signalsubstans som produceras i kroppen av tryptofan (en aminosyra) Tryptofan kommer från maten och tas upp av cellen där den omvandlas till 5-HTP som därefter omvandlas till serotonin (för lugn och avslappning) samt till hormonet melatonin som reglerar vår sömn. Fördelen med att ta 5-HTP i stället för tryptofan är att 5-HTP lättare omvandlas till serotonin. 5-HTP is the forbearer to serotonin. It is used to improve a person’s mood as well as lessen anxiety levels and aid in weight loss. Using addictive substances, such as tobacco, alcohol, caffeine and certain narcotics, has been know to elevate serotonin levels. When you eliminate these substances, your serotonin level drastically drops, which is what causes cravings and anxiety. 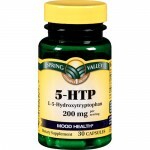 Using 5-HTP can aid in stabilizing the body’s serotonin levels and help to minimize withdrawal symptoms. Women who suffer from PMS have reported that the use of serotonin relieves pain, lessens irritability and also helps to control moods swings. This happens because the supplement balances out the decrease in serotonin levels caused naturally by serotonin. Serotonin has been known to have a calming effect. Beccause of this, many people use it to alleviate stress-attacks and to assist in getting a restful night’s sleep. 5-HTP is unlike sedatives, because it does not cause any unwanted side effects, such as grogginess and disturbed sleep schedules. When taken about an hour before bed, it can work as a remedy for insomnia. Note: Now Foods only uses Pharmaceutical Level 5-htp, produced by Axel Chemicals (Nuova-Linnea) in Switzerland. Positively the best value in the world!